The U.S. Army Corps of Engineers has detected slow oil leaks from two transformers at Ice Harbor Dam that spilled an estimated 1,500 gallons into the Snake River, including low levels of toxic PCBs, the Washington Department of Ecology said today. The Corps reported that about 800 gallons of oil spilled from one of the transformers contained 2 parts per million of PCBs, a largely banned industrial insulator that persists in aging equipment. 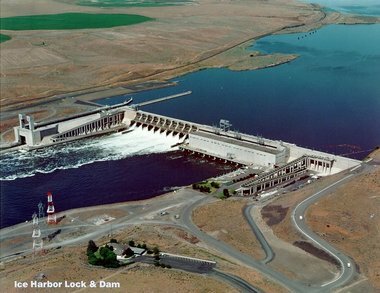 Oil leaks and PCB contamination from dams on the Columbia and Snake rivers have long been a concern. Corps officials first spotted and reported sporadic sheens in December, but believe the leaks have been occurring since June based on transfomer oil inventory records. The spill, near Pasco, Wash., was not dense enough to require immediate clean up actions on the river, regulators said. Bruce Henrickson, a spokesman with the Corps' Walla Walla district, said the Corps had difficulty tracing the source of the sheens, but eventually pegged them to pinhole leaks that grew over time in corroded cooling units. Slow Leaks at Ice Harbor Dam Spill 1,500 Gallons of Transformer Oil into Snake River <-- Full story at original site.